Members of the cousinry came for lunch recently and the experience was an eye-opener in understanding the effects of having broken my wrist. Yes, the cast is off and physio is coming along nicely, but let’s just say that preparing a meal is the kitchen equivalent of walking through water. Everything takes that much longer and requires more energy. Unfortunately, being the optimist that I am, my strategy for executing this meal was based on my normal capabilities. Even though I’d started to prep the night before, when my cousins arrived for lunch the food wasn’t ready and I hadn’t had that spare 20 minutes where normally I change my clothes and tastefully tart myself up. But no matter, there were helping hands and lunch made it to the table not too, too late. And the star of the meal, a Tex-Mex Taco Salad, was worth the wait! It was a pretty simple lunch, just soup and salad with cupcakes for dessert. The soup was my Roasted Red Pepper and Tomato, but a kicked up version (okay, that was a bit of an accident since I grabbed a container of tomato sauce jazzed up with cherry bomb peppers from the freezer instead of a plain version). But, let’s forget all that and focus on the salad. Yes, I’ve made similar salads before, but this version was much more refined than any of its predecessors. The recipe is from the “Sensational Summer Salads” cooking class I attended recently at Jill’s Table here in London 🍁. It’s one of my favourite places to shop for all things kitchen and I’d been wanting to take a class there for years. I finally treated myself and had an enjoyable evening, trying three different salads including this one, and experiencing tastings of olive oils, vinegars and salts. I also had my first introduction to avocado oil, with its deep green, jewel-like colour and intense avocado flavour. 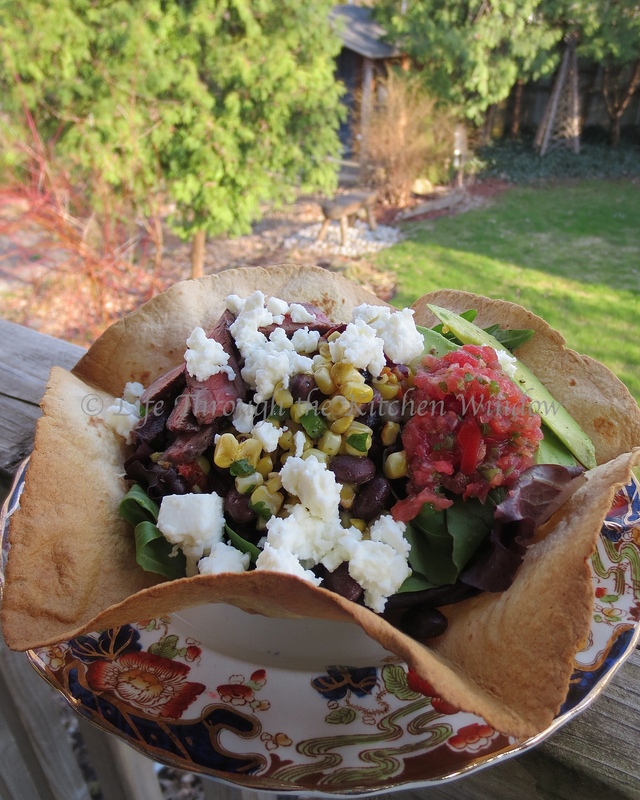 This taco salad is perfect for casual entertaining, a view reinforced by my diners. You need only look at the ingredient list to know that it offers a medley of both flavours and textures. Serving it in a baked, fluted tortilla adds a visual wow factor and a dollop of pico de gallo parties it up with extra pizzazz. The only change I made to the recipe was to add thin slices of grilled steak to keep the men at the table happy. This salad will be a staple this summer — all it needs is a patio table and an ice-cold cerveza. DISCLAIMER: The recipe below is provided with permission by Jill Wilcox. I paid for my cooking class, was not asked to write this post and am not being compensated for it. When I run across a recipe this good, how could I not share it? All opinions are, of course, my own. Recipe by Jill Wilcox; shared with permission. My notes are in italics. Serves 6 portioned as a first course. Of course, you might want to share it among two or three people as the main course of your meal. You can prep the night before by grilling the corn and red pepper, along with the steak of your choice if you choose to add thin slices of it as I did. In a large bowl, combine the beans, corn, red onion, jalapeno, red pepper and cilantro. Toss lightly. 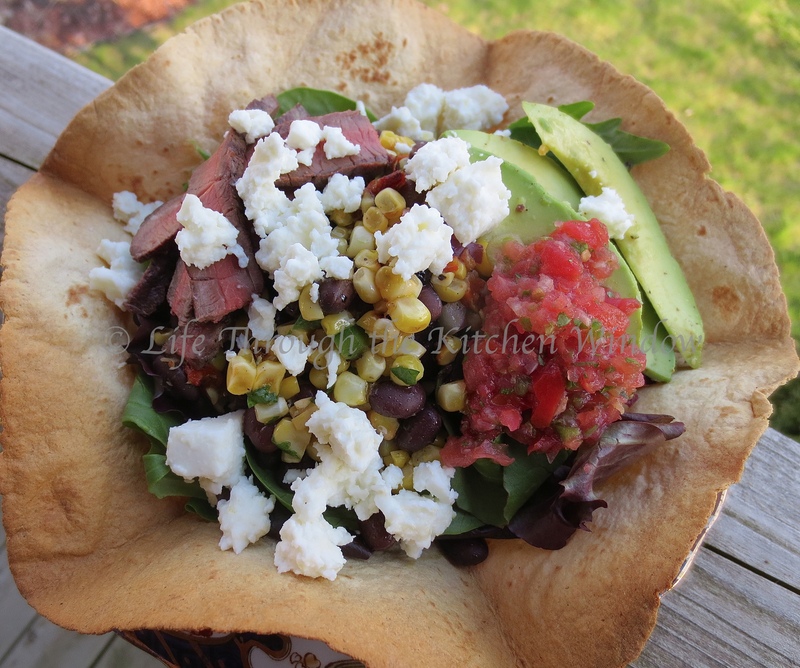 Make the dressing by combining the avocado oil, lime juice and oregano in a bowl. Whisk to combine. Add salt and pepper to taste. 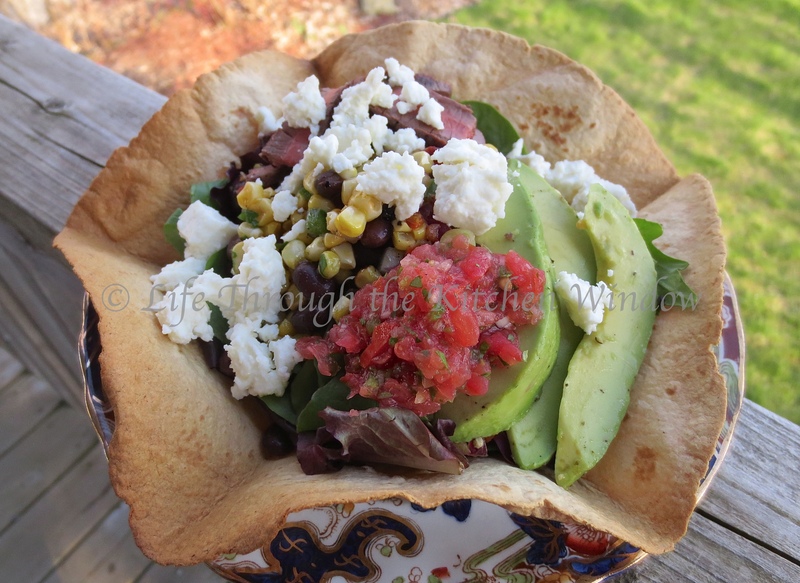 Divide the greens among the tortilla bowls. Spoon the bean mixture over top. Sprinkle with cheese and garnish with avocado. Serve with pico de gallo. Combine all ingredients in a bowl. Season with salt to taste. The salad sounds delicious! And your photography is terrific! So glad it appeals to you, and thank you for the compliment! Thank you for your comment, Shae. This is a salad we can make any time of year, but it’s especially suited to summer, I think. Thanks for stopping by. Beautful pictures and text Mar! Thank you for your comments, and for waiting so patiently while I kept your salad captive during the photo shoot. At least we didn’t have to worry about it getting cold! This salad looks fantastic, Mar. As you said, so many flavors and textures, just like a good taco salad should have. I like, too, your recipes for avocado dressing and pico de gallo. Normally I would look for the sliced steak but, to tell you the truth, I really wouldn’t miss it if it wasn’t there. This salad is pretty substantial on its own. Good to read that the cast is off. Won’t be long now and you’ll be back at 100%. Yay! “Fantastic” – thank you! I agree with you about the steak; it’s a nice touch, but I enjoyed the salad just fine without out it. My son was one of my guests at the lunch, and since he’s a bit of a selective eater I thought I’d throw some steak in for him. Thanks for your kind words about my recuperation. I’ve made a great deal of progress in the last little while, alleluia! Not at 100% yet (and may not get that far) but it’s going well. It’s a good thing when the physiotherapist is happy! That’s so nice to hear; I hope you enjoy it. Thanks Kay! My current favorite salad is a steak salad – all you get is shrimp or chicken at most places, Marlene. So this is definitely one to try next time I have leftover steak! Leftovers don’t happen very often here, but with Lucas in Prince George now & Anthony will be in Ontario diving by the end of the month I might just get some leftovers during bbq season this summer. Anthony is waiting for the lakes to thaw in northern Ontario!?! love your sense of humor kiddo! A brightly colored Mexican blanket behind the salad would have added to the photo – you’ll have to come to Mexico to acquire the real thing seeing as I’m not next door to lend you one, Mar! Ah, the real trick, Anne, is to slice the steak that you need for the salad, tuck it away in the fridge and then serve the steak. You can think of it as preemptive leftovers! The Mexican blanket would have been a nice touch; I just don’t happen to have one. I think I need to travel more! Taco salad is my favorite! 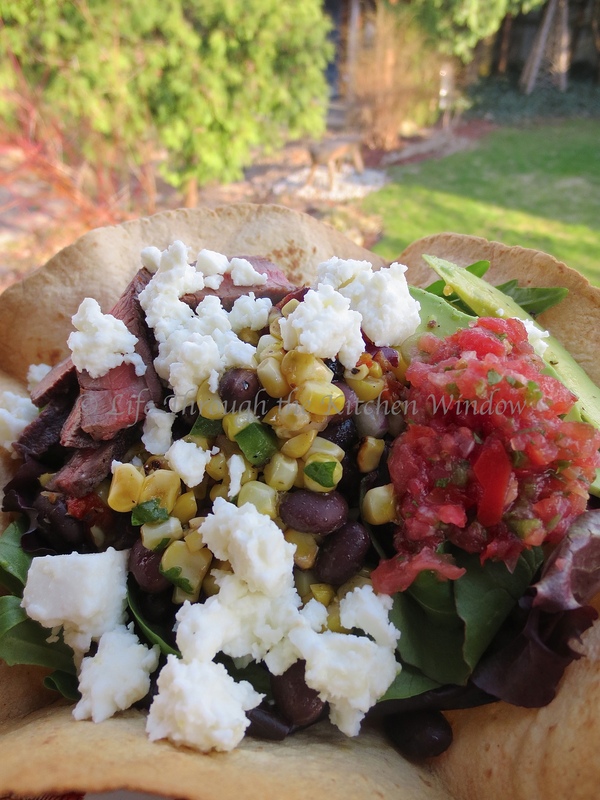 Lately I’ve transformed it into tostadas by serving it on those big crispy baked corn tortilla or alternatively I crumble the baked corn tortilla into my salad as a topping. I’ve never made avocado dressing. I’m definitely going to try yours! There are so many ways to change up a recipe like this – art of the fun! Do try the avocado dressing, you’ll be glad you did.